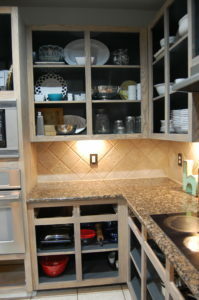 I am in the process of slowing updating my kitchen and I started with my kitchen cabinet interiors. 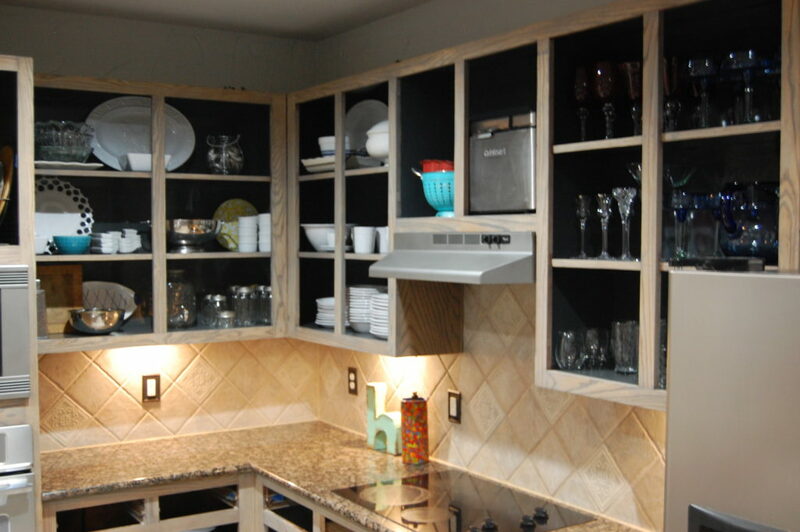 You may not think that the inside look and organization of cabinets with doors make a difference but it really does. You can see by the picture that the insides of my cabinets were the original ugly brown with a ton of wear. I am also in the process of refinishing the exteriors but that will be covered in a future blog. I started by moving everything out of my cabinets, then I removed the doors and drawers. If you are not going to refinish the exterior, don’t remove the doors. The drawers will be easier to paint if you take them out. 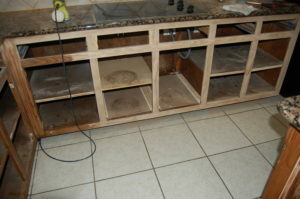 The inside of the cabinets are particle board finished in the same stain as the exterior. Any area that has been exposed to water has a very rough raised texture, so I knew I needed something that would coat and camouflage those areas. I did not do much sanding prior to painting the interiors because the Varathane product worked so well to cover and coat the surface. If you have fairly high gloss interiors, you may need to do a test area to see if your new color/product will adhere well to it. I opted for a darker shade for the interior and used a product that’s a combination stain/sealant – Varathane Premium in carbon grey. 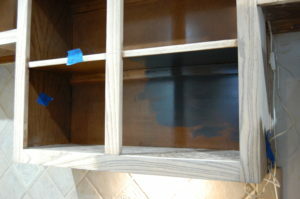 Because space is somewhat limited when you are painting the cabinet interiors, use a small roller and an angled brush. The small roller doesn’t get too full of paint and is easy to control. While you want a thick coat, be careful to avoid drips coming from the sides or “ceilings” of the cabinets. Lighting is key for painting the interiors, especially with the dark brown original color. Prior to moving back into your kitchen, go through everything and get rid of things you no longer need. This step is key to loving the way your new kitchen functions. 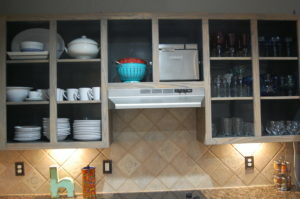 I am usually still cooking when my guests arrive, so I wanted my upper cabinets to be beautiful, almost like you would arrange open shelving. Pay attention to color and size, and be careful not to crowd and stack. Anything chipped, mismatched or plastic was gone and my favorite things arranged so I can see each piece. To do this, place platters at the back, one each and then bowls or cookware that won’t cover them up completely. I moved my spices to drawers instead of in the cabinets, got rid of my kitchen “medicine cabinet”, limited my kids junk drawer to one (not four) and moved anything that I rarely use to a large inconvenient space under my island. I will be putting the doors back on but I am enjoying how they look either way. Would love to see the overall finished look of your kitchen. I am thinking of doing a similiar project and I am having a difficult time choosing the perfect colors. My kitchen is all white currently and it needs color for sure. Thanks Elizabeth! I will be posting each step/stage of my kitchen makeover in the coming weeks. 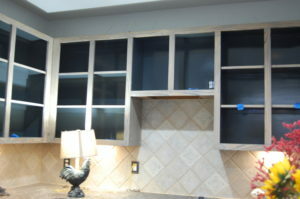 This will include the exterior look of the finished cabinets, new countertops, backsplash, lighting and small details like the hardware for the cabinets and a new sink. I am going from a dark cabinet/counters to lighter but not all white, so I hope my look inspires something awesome for you! I’m Juan and in the process of remodeling my kitchen. Very glad to see your kitchen’s makeover so far. It looks great. Thanks for your blog. Keep them coming. Thanks Juan! The cabinet exteriors are almost done..blog coming soon! 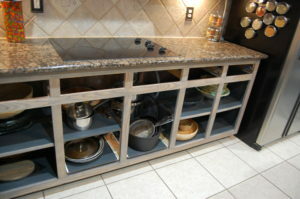 I still have trouble understanding the open shelf kitchen trend. I clean my house. I don’t fry food. Still, the top of my fridge needs cleaning, and the antique punch set I store there needs cleaning from dust and gunk. So when people “display” their kitchen, do you from time to time have to pull everything out and wash it? Frankly, I don’t have dishes and glassware that is exhibition quality, so I need those doors LOL!! I hear you on the constant dust and grime on the top of the refrigerator – it drives me a little nuts! My cabinet doors are back on, but I really enjoy the pretty interiors when I open them. I cook/host a lot and I am always still cooking when my friends come over, so I love that when I open my cabinets…they are pretty and neat, not to mention clean. What an amazing transformation, this looks stunning! We, also, are in the thinking and planning stages of remodeling our kitchen, and I think this is just beautiful. Thank you so much for sharing! Thanks, Gina ~ Good luck on your project!